Hello friends…I got in a mood this morning and started cleaning up my work area. Not sure what stirred me on but it was long overdue. I happened upon a stack of notes that I had been collecting and in the stack I found this Downton Abbey quote. I had completely forgotten about it…and it immediately made me miss Mr. Carson and Mrs. Hughes. So I thought if you might be missing them too, a free printable might help. 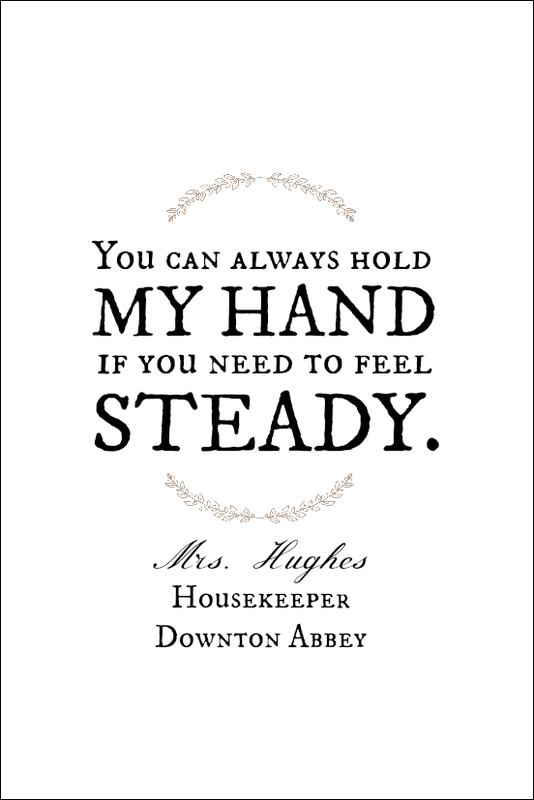 Click here to download Downton Abbey Mrs. Hughes Quote Free Printable. I do hope they are getting along OK and realize how much they are missed. Thank you for the Strawberry recipes, here in Maryland they have started Pick your Own, at the farms. I will pick and bake this week. Thanks again. I did love the ending and miss the series now. Thanks for the download! It’s lovely! Oh Diane…your comment made MY day. Have a good weekend! Yes, I agree…..a very sweet moment to end the series. I can’t wait for the next season. It’s amazing how we all got so “hooked” on this series. With all the grandeur and beautiful scenery, there is a simple tenderness to these people. Thanks for the words to remind us. Ann, what a generous giveaway. Thank you, I’ll be making a pillow using this quote for my neighbors birthday. I have to find a way to see this show from the beginning so I’ll be ready for next season. Sonny you can get it on Netflix I think or maybe even at your local library. All the seasons are available on DVD. You simply HAVE to watch it! Oh Ann, I completely agree. I too miss Mrs Hughes and Mr Carson! Downton Abbey is one of our favorites. Thank you so much for this lovely printable! Thanks for the reminder of that last scene of Downton Abbey, it was so sweet! I can’t wait for the new season to begin–sigh. Absolutely, Ann! I miss Downton terribly. My husband and I can’t wait until it comes back. What a darling quote. It is going in my bedroom! Don’t you just love DA? I miss it!